When I saw Burr posting about using hydrogen chloride (HCl) to drop KH, I was intrigued, so I went ahead and bought some. I’m sure I’m not alone here. I plan to dose 1 mL per 6 gallons of water to drop KH by about 1 KH. I am not sure what my % HCL I am dosing the muriatic acid I bought is a low fumes brand, with a proprietary amount, so I suspect it’s less than 30%. My tank tested at 3KH using a new API kit, changes color on the 3rd drop. 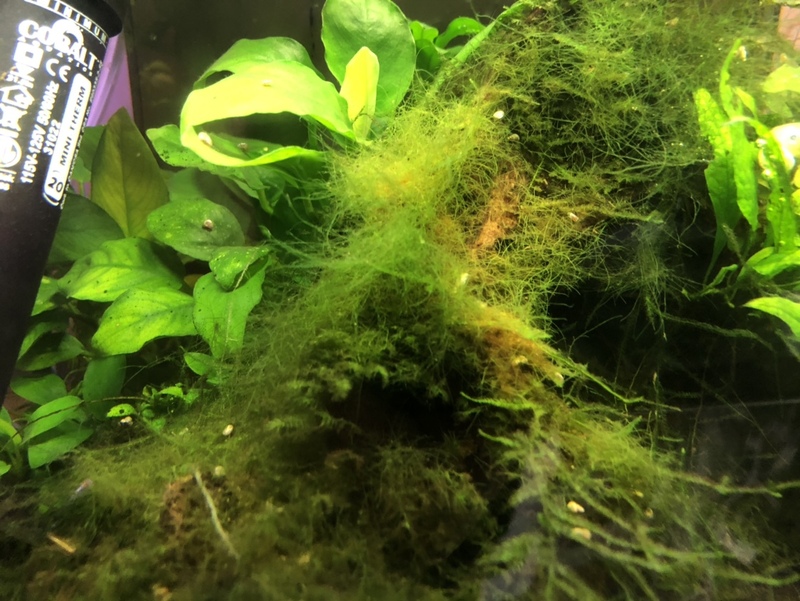 I have a 4 low tech tanks that have medium light, one tank in particular, always has some green string algae growing from the top of the wood which sits about 4” below a 10w cfl. Well I was wandering... what if I drop in a dose with a syringe directed at the algae... well here it is just minutes after. Hang on filter was kept on, and output is directly over the top of this spot. See below, the light green/yellow spots took a direct hit. Im definitely not going to be doing this on a regular basis, given the hazards of using HCl and well, you can only dose so much in the tank without seriously dropping pH. Interesting. Ive been wondering if a direct blast would kill algae. My fish think its feeding time and they usually take a direct hit. So far hasnt seemed to phase them. I always add it to the strongest current though, so they arent in the middle of it long. chayos00 and Immortal1 like this. I have 1 amano shrimp that’s been in this tank more than 8 years... I’d hate to kill it just to get rid of the algae, so the algae lives on. Unless you are going to dry spot dose HCL and burn/kill every living thing in proximity to the dose, (I have put holes in my t-shirts splashing 5M lab grade HCL when cleaning) as an algaecide in solution it makes no sense whatsoever. HCL in solution raise H+ and lower pH once dissolved and mixed. I'd much rather add acids I can add as a salt than 'mystery concentration' solutions. As an algaecide this is a complete bust for me. For my situation I will be adding the HCL to the 20g holding tank under my main 75g display tank. For HCL I will be using this product from Menards. According to the technical data sheet it is roughly 32% Hydrogen Chloride. After reading thru @burr740 post on his journal, it sounds like 3ml of this percentage of HCL should drop the 20g of holding tank water about 2dKH. Is this something that is permanent and safe? I ask because my tap water is about 4-5 dKH - I would like to use aquasoil in some tanks. Could I use HCL to get rid of the KH before using it in tanks with aquasoil safely, without harming shrimp, fish, plants, etc? Definitely not the purpose of dosing HCl, just kinda happened as I dosed with a syringe with a long needle the tip was right above the algae and I literally squirted 0.5 mL and posted my observation. I do not endorse the direct use of HCl as an algaecide. Due to my observation, and concern that it may burn plants or fish, I plan to always drip it in slowly in an area of strong flow if I am dosing into the aquarium. From now on I will only be dosing a holding tank during water changes unless of course I forget. I have 2 12 gallon plastic containers that I fill and temp correct before water changes. How long does it take for the acid to take effect and get rid of the KH? Mix it before in a jug or bucket with tank water changes. No need to expose livestock to concentrated acid ever. I did not measure the change... I believe Burr noticed a drop very quickly, I think he measured KH about 15 minutes after dosing. Wow very nice. Have you found this method to be stable, as in, the KH remains gone indefinitely? That’s the idea, you need to keep up with new water during water changes to maintain it. Let me point you to where it all got started for me... worth a read through, many good posts further down as well. 120 Gal Dutchy Freestyle - Now with 35% less water volume! Greggz and Immortal1 like this.